Last week, Pip kicked things off with “The Evil that Befell Samson” and this week we present the supernatural steampunk “Dust on the Davenport” by author O.M. Grey. 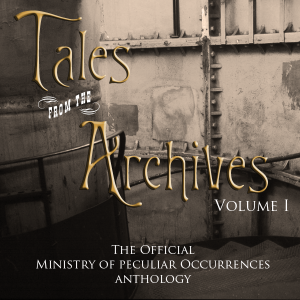 You can subscribe to Tales from the Archives on iTunes (and leave us a review there), or with your podcatcher of choice at the Ministry website. If you hear a short story you particularly like, go on and feel free to syndicate it on your own blog or podcast. Thanks for listening! An excellent episode. O.M. Grey does a lovely job with the writing, and the whole podcast shows off Tee and Pip’s usual high production values. I am still somewhat amazed with Alex White’s soundtrack.